Yankees starter Sonny Gray had another nice outing, taking advantage of another weak opponent (his last start was against the Mets), as he threw five shutout innings, in which he scattered three hits and two walks, while striking out five. He is now 8-7 with a 5.08 ERA on the season. The Yankees manufactured a pair of runs in the bottom of the first, as Giancarlo Stanton got a sacrifice fly, followed by a Gleyber Torres RBI groundout. In the fourth, Austin Romine got an RBI double, followed by a three-run homer for Didi Gregorius that made it 6-0. Aaron Judge was hit by a pitch the first inning, and the Yankees announced after the game that he sustained a chip fracture of the right wrist. The recovery time is estimated to be three weeks. The Yankees got a pair of solo home runs from Darryl Strawberry in the second inning and Derek Jeter in the third, and the game was tied at two after the first few innings. Anaheim blew it open in the fifth against Yankees starter Orlando "El Duque" Hernandez. Dave Hollins started it off with an RBI double, followed by a Gary DiSarcina RBI single, an Orlando Palmeiro RBI double, a Jim Edmonds RBI single, a Darin Erstad RBI single, and capped off by a two-run homer from Tim Salmon that made it 10-2. El Duque was pulled after the Salmon homer, and he was charged with 10 runs on 13 hits and no walks with three strikeouts, to fall to 5-3 with a 3.66 ERA. 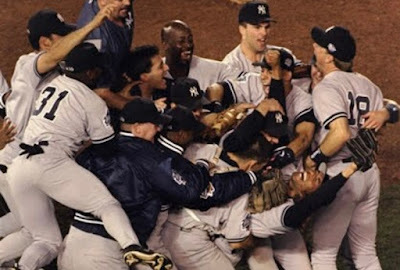 Where they stand: The 2018 Yankees (65-36) gained a game, and are now nine games off the pace of the 1998 Yankees, who were 74-27 through 101 games.